The mad king of all-wheel drive once more scampers to the ramparts, screaming. 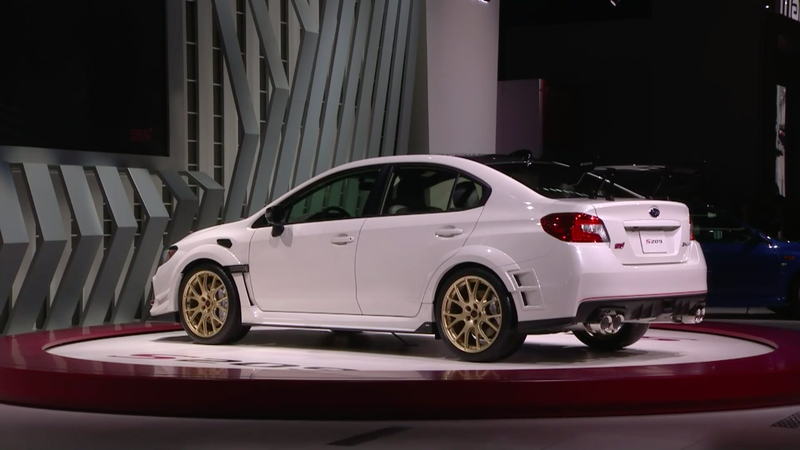 The Subaru WRX STI S209 is here for my Americans! The first S model for America! Rip four tires with 341 horsepower. Vanquish thine enemy: Mitsubishi. Though there is no Evo to fight against, Subaru continues to wage its own war, thrashing against its own shadow. I guess that’s not true. Certainly this special edition Subaru isn’t cheap, and if you view it as a premium car, it is against some stacked competition from AMG with the 45-series CLA and GLA, not to mention the Audi RS3 with 394 hp. The latter car starts at $55,000. If you’re curious about other performance comparos, the Type RA managed 310 HP for, yeah, $50,000. Production there was limited to 500 units. But Subaru says that this car is the fastest STI ever. Much of that, I assume, is down to the water sprayer for the intercooler. Not really. I would peg it more to the 19x9 BBS wheels this thing rides on, running 265/35R19 Dunlops. (They’re Dunlop GT600As if you’re curious.) The Type RA makes do with 245s. Availability is “limited” but Subaru isn’t saying how much. The Detroit News reported a figure of 200 units, but Subaru has not yet confirmed that exact count, nor has it confirmed the actual price of the S209 yet. What stands out is that this is a Japanese-built car, with a tuned EJ25 with a bigger turbo, bigger injectors, water sprayers, and some intercooler work. Forged pistons and rods are also part of the equation, along with a new intake. Torque is unlisted, but weight is. This thing comes in at 3,485 pounds, and that’s with a carbon roof. Those new fenders, I should not forget, make the car about 1.7 inches wider overall, per Subaru. Also new are “specially developed Bilstein dampers, dedicated coil springs and stronger pillow-type bushings,” per Subaru, along with “a flexible front-strut tower bar and flexible front and rear draw stiffeners.” Trust me, you will feel the living hell out of those... draw stiffeners. All that being said, I do not believe in my heart that the other vehicles this car stands against have the pure anger and aggression of Subaru and this newest STI S209. I bow before it. I kiss the dirt. Slide before more, S209. Pelt me with rocks as I return to you praise.